1967 1968 1969 1970 Camaro. 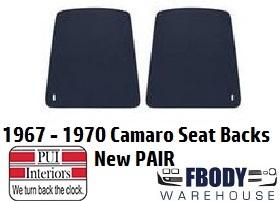 You can easily replace worn, scratched, or faded seat back panels with these rigid ABS reproduction panels. All mounting holes are pre-cut and original type mounting tabs correctly placed to ensure a perfect fit. Also features Madrid grain plastic for originial appearance. NOTE: 1967 had a metal version of this unit but these will directly interchange on 1967.